In the most severe form of male infertility, men do not make any measurable levels of sperm. This condition, called azoospermia, affects approximately 1 percent of the male population and is responsible for about a sixth of cases of male infertility. Often men with azoospermia don’t know the underlying cause of their condition. Now, a new study from researchers at University of Pennsylvania, St. Luke’s Hospital, Boston University and Massachusetts Institute of Technology suggests that mutations in an X chromosome gene called TEX11 are responsible for a significant number of cases of infertility, an estimated 1 percent of cases of non-obstructive azoospermia. The study is published in the journal EMBO Molecular Medicine. 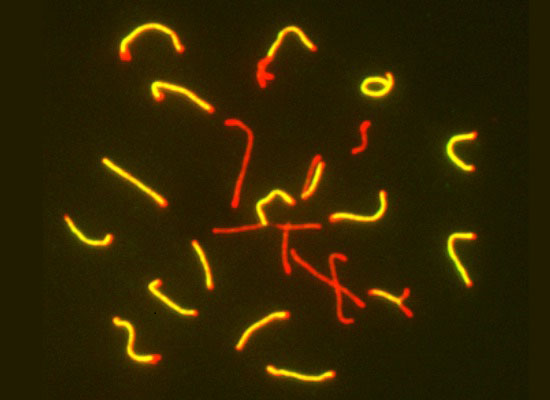 The current study has its roots 15 years ago when the team cloned the Tex11 gene and found that it was specific to germ cells and was located on the X chromosome. In 2008, the researchers published a study showing that disrupting Tex11 function caused sterility in male mice and caused female mice to have smaller litters. The previous study found that this disruption halts the maturation of germ cells by interfering with meiosis, the process by which an individual’s genetic material is divided and sorted into what eventually becomes eggs and sperm. To further extend these findings’ implications for humans the current study screened genomic samples from 246 men with azoospermia as well as others to serve as controls, looking for variations in the TEX11 gene. They found more variants in men with azoospermia than in the controls, hinting that the protein plays a key role in sperm development in humans. The team state that though it can be difficult to create pedigrees of infertility for the very reason that men with the condition cannot have children, the researchers did find a person carrying a mutation in the TEX11 gene who had a compelling family history. Both he and his brother were azoospermic, and a genetic sample from his mother showed that she was heterozygous for the TEX11 mutation. Both of his maternal uncles were childless, though the researchers didn’t have their genetic material to confirm they had the same mutation. The researchers conclude that the pattern is indicative of a trait passed down the maternal line on the X chromosome, inherited from the mother. Because these two maternal uncles are sterile, ultimately, they believe that it traces back to the individual’s grandmother. To experimentally test whether the mutations that were identified in infertile men were the reason for their azoospermia, the research team selected three mutations found in the azoospermic men but not in the controls. They then engineered mice with versions of Tex11 that bear those same mutations and experimentally bred mice to express those mutated versions. The results showed that for two of these mutations there was little effect. However, the third had striking effects, males with this variant had significantly lower sperm counts than control animals. In addition, these mice had abnormalities in meiosis. In total, from the screening of 275 men in the current study the researchers found three mutations in TEX11 that appeared to be the cause of the infertility, resulting in a rate of about 1 percent of cases of azoospermia. The researchers state that given that there are hundreds of candidate genes for male infertility one percent is very significant. The team surmise that as a there is a trend toward precision medicine more people can have portions or the entirety of their genome sequenced, these results have implications for genetic counseling for infertility. They go on to add that the current study shows that if men had one of these same mutations in this gene the medical community can now safely say that’s the cause of their infertility. Mutations were identified in the X chromosome-linked germ cell-specific gene TEX11 in infertile men with non-obstructive azoospermia. Functional studies of TEX11 protein in mice revealed an unexpected role in the regulation of genome-wide recombination rates. TEX11 is mutated in infertile men with azoospermia and regulates genome-wide recombination rates in mouse. Wang et al 2015.